FC Barcelona won their 4th Champions League Title of their history with a classy 3-1 victory over English Champions, Manchester United. 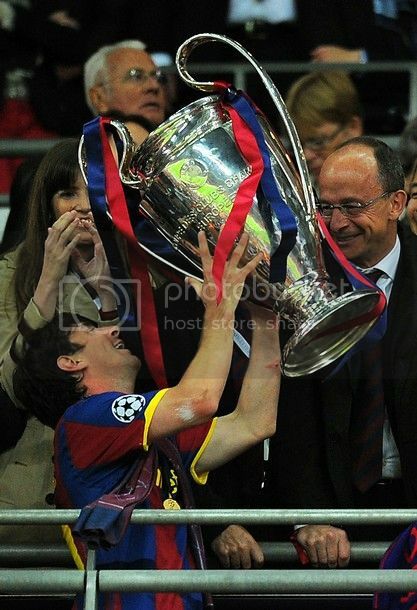 With this victory we have won three Champions League title in last six years. In a picture perfect night goals from Pedro, Messi and Villa all scored to give Barca the victory and continue their love affair with the Wembley stadium. With his goals in the final, Messi has equalised thh record of most goals in a UEFA season and most probably has secured another Balon d'Or. It was kind of a footballing lesson handed out to Manchester United. The stats speak for itself. We had 16 shots, 12 On target, with 63% possession and 6 corners. 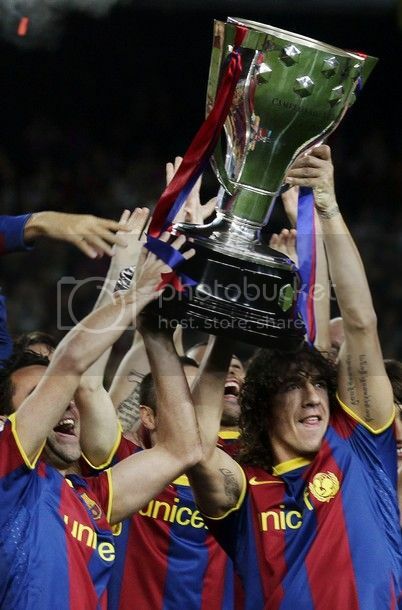 The best moment of the night was Puyol giving the Captain's Armband to abidal and he received the trophy from Platini. The official line-up was a big shock for everyone as Puyol missed out on the starting eleven. Puyol was considered a absloute certainity till the time official line-up was released. Apart from the shock of Puyol missing out the rest of the line-up remained the same as I predicted in the preview. We had Valdes in goal. Alves, Pique, Mascherano and Abidal made the defense. Iniesta, Xavi and Busquets made the midfield. And the front trio was the usual Messi, Villa and Pedro. The bench had Oier, Adriano, Puyol, Keita, Thiago, Afellay and Bojan. That was quite a surprise, if Puyol is fit to be on bench, then why not starting eleven? Manchester United lined up as Van der Sar, Fabio, Ferdinand, Vidic, Evra, Valencia, Carrick, Giggs, Park, Rooney and Hernandez. Whatever be the result, come tomorrow history will be made. FC Barcelona and Manchester United will face each other in this season' biggest final, UEFA Champions League final at the Wembley stadium, a place both team claims as their destiny. The Old Wembley stadium has been very precious for these two teams - having won their first European titlesover there. What will be in store for these two clubs when they meet each other tomorrow night at the New Wembley stadium. Two seasons ago, an all conquering Barca side made short work of a highly talented Manchester United side to lift their third European title. That match and the embarrasing loss has been in every Manchester United players mind in the build up to this final. You can sense that from their repeated emphasis of making ammends for that loss. Ever since the loss at Rome, Sir Alex Ferguson has repeatedly gone on record stating that he knew what went wrong that night and will make sure that its not repeated again. Barca has only played at the New Wemblye stadium one, a season opening friendly at the New Wembley. Meanwhile Manchester United has played seven matches over there and Park was quick to point out that Man U will be having the home advantage for this match. Strangely enough Barca has been seeded as the home side in tomorrow's final. The good news is that we have never lost an European cup final after being seeded as the home side. Ok, many of you would have already heard the news... No it's not about Giggs and his Super injunction, its about that Volcano eruption of the Volcano whose name is quite tricky - Grimsvoetn. Last season there was a similar Volcano eruption which disrupted our travel plans to Milan. We had to make a two day bus journey and it took a heavy toll on player performance. Compared to that Volcano, Eyjafjallajökull you can atleast spell this one. As the experts says this is the biggest eruption of this Volcano in last 100 years but there are some good news. The ashes are quite thick and that should see it falling back much faster compared to last year. Whatever it is, it is expected to disrupt the British air traffic atleast from Thursday and that could see us travelling a bit earlier. There are some alternative to Bus service available to make it to London. We can fly to Paris and then travel by train from there, so on. But teh best option will be to fly over their. May be our players have to take their families along with them. On a brighter side an early arrival will give us more time to settle in with the mood and climate there. By the way the picture above shows the boot we will be wearing at the final. Well, there are two games left for us in this season - one a pretty much insignificant one for us and another one which is worth dying for. The insignificant one takes place to morrow at Malaga with both teams having nothing to play for. Guardiola has taken this oppurtunity to rest a majority of his players ahead of the Champions League final clash at Wembley. 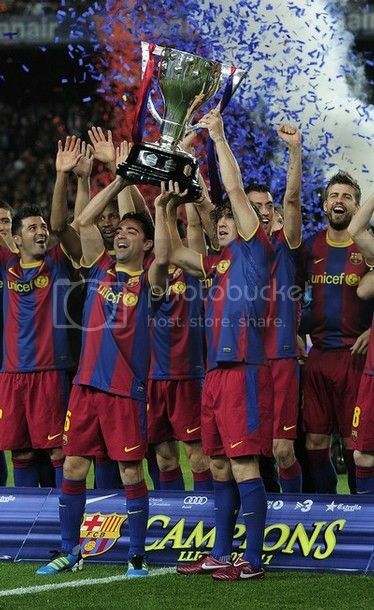 Valdes, Messi, Xavi, Iniesta, Villa, Puyol and Pique all are ommitted from the squad which will make the journey to Malaga. Unfortunately Fc Barcelona's opponent in this year's big final, Manchester United is not blessed with such an oppurtunity. It's not because they failed to win the title till now, infact they won it last season. But the stupid FA has some even more stupid rule which forces Manchester United to field a very strong side. La Liga management, definitely looks like having some competition over there. On apositive note, it could help the players to get into full focus ahead of the big final on 28th. Meanwhile Guardiola has rested almost all the regular first eleven and we have to wait to see how it will affect the players. But majority of Barca's World Cup stars will gladly take this two week off, especially after that emotionally draining El Clasico series. FC Barcelona is assured of the service of their regular holding midfield player, Sergie Busquets for the big Champions League final at Wembley. Busquets participation at Wembley was put under some doubt after UEFA opened alleged Racism abuse inquiry against the player. But UEFA has dismissed the allegation due to lack of strong evidence and also has cleared the player of any wrong doing. This is yet another set-back for Real madrid who has been on the endless journey to unsettle this Barcelona side. With Busquets available for selection Guardiola can field his usual midfield of Xavi, Iniesta and Busquets against English Champions Manchester United. This decision most probably is not going to be welcomed in most part of the Spanish Capital. Debates will still rage on whether Busquets said those words as Real alleges. A lip reading exercise throough a video evidence will never stand up for any close scrutiny and Real madrid management fo all the people should have known that. So this was another futile exercise by the Spanish Capital side to unsettle our players. The newly crowned Spanish La Liga Champion were held to a goal less draw by relegation threatened Deportivo La Coruna at the Camp Nou. That one point could be very crucial for Deportivo's hopes of surviving in the league. This incidently was the first goal less draw of Barca in the league this season. With the League rounded up, this was a great oppurtunity for the fringe players to get some playing time. 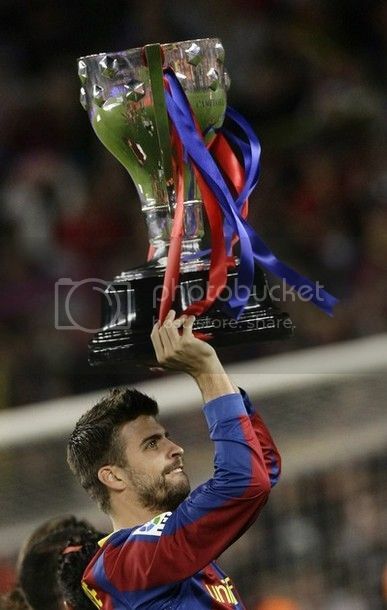 But the night was all about celebration, doesn't matter whether we win or lose - tonight was the night when the La Liga title is offcially handed over to us. 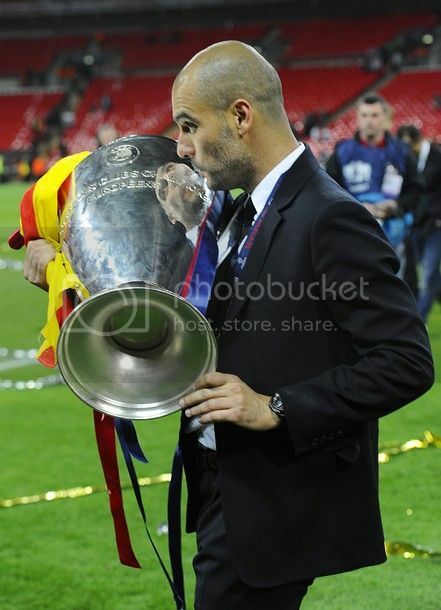 As expected Guardiola rested most of the main stars. Valdes started in goal. 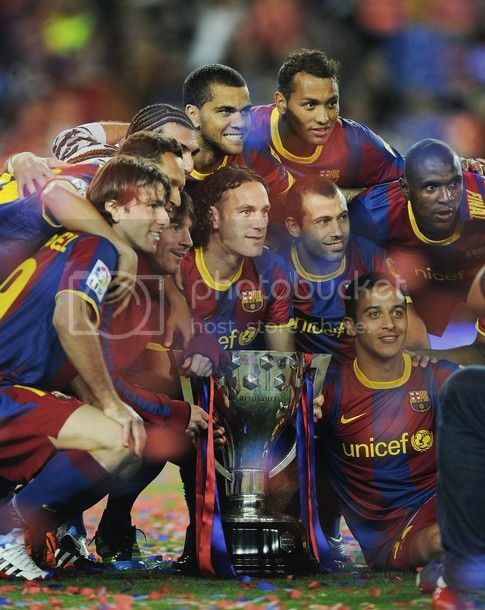 The defense infront of him had Marc Batra, Mascherano, Fontas and Abidal. The midfield had Thiago, Jonathan and Keita. The front three was made up of Afellay, Jeffren and Bojan. I have to admit that I would have put Oriol Romeu in the midfield to play in the usual central midfielder role. 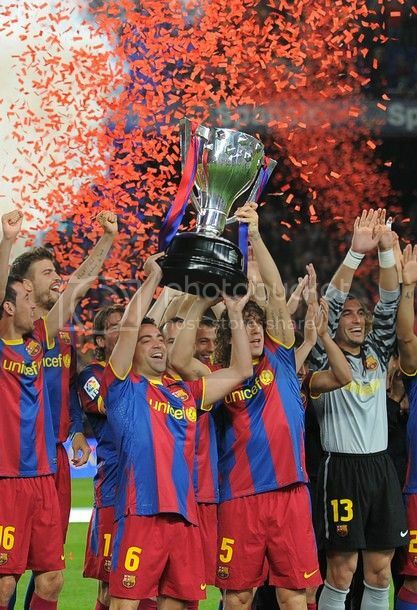 FC Barcelona won their 21st League title with a 1-1 draw at Levante with a bit of tricky performance. This was not one of the usual flowing performance by the Barca side, but it was good enough to complete a rare hat-trick of League title. The last team which did that was the dream team of Barcelona back in the 90s. A goal from Keita gave Barca the lead (unexpectedly), but Levante equalised after a complete misunderstanding between Valdes and Pique. We went into the match needing only one point to win the league and precisely did that. 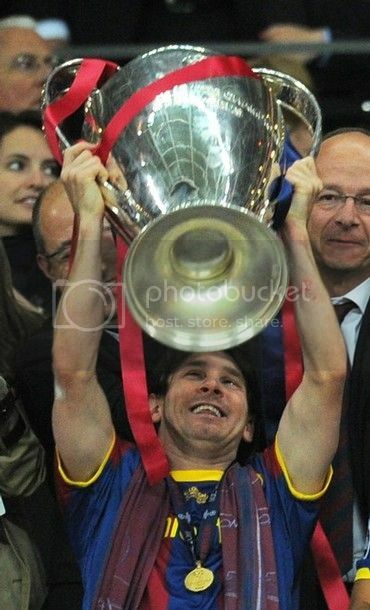 Messi would have been a bit unlucky not to have cut the Pichichi lead. Now Guardiola could rest a majority of stars in the coming match and shift the focus to the Wemble job. Guardiola made some changes to his usual eleven. Iniesta and Pedro started from the bench. So we had Messi, Villa and Afellay in the front attacking trio. The midfield had Keita, Busquets and Xavi. The defense had Alves, Pique, Mascherano and boy oh! 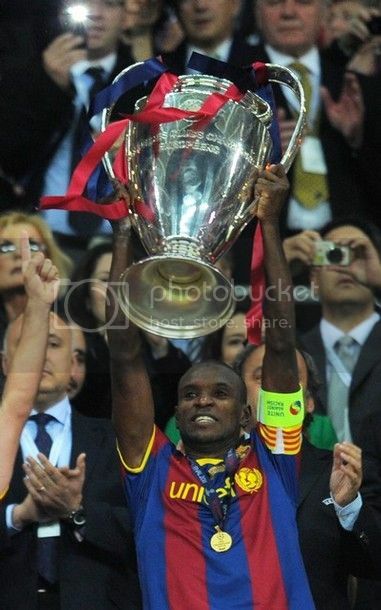 boy our King Abidal. 5000 Barcelona fans took the travel to Valencia to watch this match. 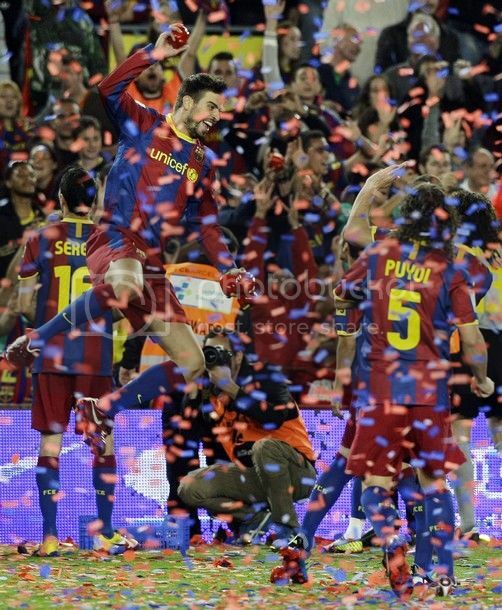 FC Barcelona took a huge step to retaining their La Liga title with a massive 2-0 victory against city rivals, Espanyol. With this victory we require only one more point to secure the title and we can expect the team to round that up on their trip to levante in mid-week. Iniesta opened the scoring for Barca in the 29th minute and Pique completed the scoreline with a header in the 48th minute. 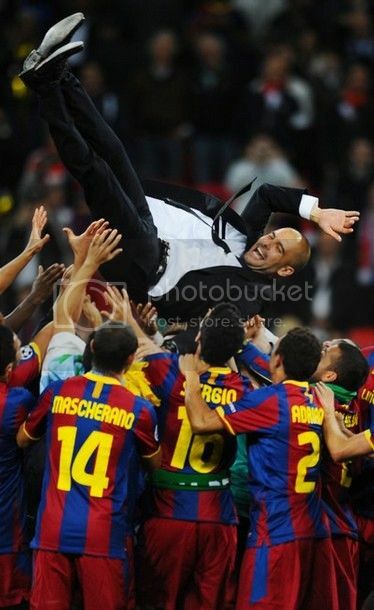 Guardiola rested Puyol for this all important derby match. We had Alves, Pique, Mascherano and Fontas in defense. Xavi, Iniesta and Busquets formed the trio. 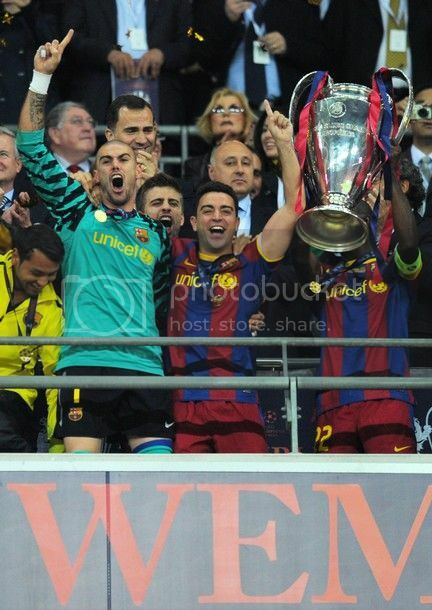 And we had the usual MVP up front - Messi, Villa and Pedro. FC Barcelona booked their place in this year's Champions League final in Wembley with a 1-1 draw against their bitter rivals Real Madrid. The only draw back of what was a perfect night was the stupid goal we conceded. Pedro put Barca ahead early in the first half but Marcelo equalised for Real Madrid. Mourinho will be out tomorrow with his guns blazing with his new found nonsenses.Guardiola went in with a starting eleven as I predicted in the preview. The defense had Alves, Mascherano, Pique and Puyol. The midfield had Iniesta, Busquets and Xavi. The attacking trio was once again the Villa, Pedro and Messi. Real madrid lined up with Diarra, Alonso and Kaka in midfield. The front attacking trio was Maria, Higuain and Ronaldo. The defense had Arbeloa, Carvalho, Albiol and Marcelo. FC Barcelona vs Real Madrid encounters usually in a literal sense is described as a Sporting war between two of the most famous clubs, but this time around it is definitely a War(not only in literal sense). The relationship between the two clubs are at the edge of no return, and it won't take a genius to predict taht by the time this match is over - it would have already moved into a point of no return. Both camps have been up in arms following the very controversial leg at Bernebeu and no party is not letting things to settle a bit. As Sid Lowe wrote, in all these histrionics the real loser could be only one team - The Spanish National side. I will be really surprised to see any harmony between the Barca and Real players in the Spanish side as the relationship has deterirated significantly since the start of El Clasico series. Many national side had worked tirelessly without success to defeat this national side. But it looks like they only needed a little bit of Mourinho. At this very moment, Real madrid has filed an officiant complaint to get six Barca players suspended. They still argue that the challenge of Alves by Pepe was fair. The best answer for that is what Hiddink said - "If Dani Alves had had his leg on the grass, that leg would now have been ­broken." That explains a lot of the violent nature of that challenge.